Usually I keep this under lock and key but this year, I thought I'd reckon I'll spill it and get feedback along the way. Sarah knows so it won't be such a surprise, but anyway, you can't win them all. 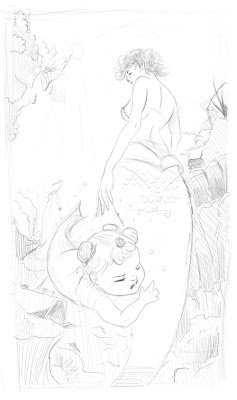 So here is the initial sketch of detail and the feel of the piece. I hope I can get it finished by the end of July, so I'll keep y'all posted!